The one good thing about this issue is that it starts you off fresh. There are no long continuities or anything to get caught up with. You get everything you need to understand the character in this issue, and that makes this a pretty good debut issue for a new series, I find. Especially one in a season of #1s where the objective of such relaunches is to bring in new readers and offer them something different. She-Hulk definitely hits those check-marks. But the thing is that is not all to it, of course. The story needs to be good to keep people interested, to make those new readers stick with the series. And the same goes for the art. The art needs to do a lot of the heavy-lifting, because more than anything the art is going to be a major part of the tone of a new series I find. And that’s where She-Hulk #1 doesn’t really work at all. The script is mediocre at best, incidentally. Expecting a promotion and a bonus because of all the hours that she put in during the last year, Jennifer Walters walks in to meet with the partners of the her law firm, and then is told that she isn’t getting anything because she didn’t do what she was really hired to do: use her superhero connections to bring in contracts and businesses for the firm. She is simply a tool for the firm to increase their business. She walks out, quits her job, takes on a freelance case that pits her against Tony Stark’s legal team and that, as they say, is that. Sure, she ends up getting on top, and a large part of the middle of the issue is no doubt driven by Charles Soule’s own experience as a lawyer (IIRC, he sunlights as a lawyer in addition to being an extremely prolific comics writer), but none of it really resonated with me. The book is low on the action front. What little we get, is mostly off-screen or we only see teasers of it. The focus is all on Jennifer Walters rather than her superhero persona, a difficult thing to pull off narratively since visually she is She-Hulk. The script, because of that adverse focus, just seemed to banal to me. I mean, its kind of like watching an episode of Leverage but without the actual heist angle. Or reading a done-in-one issue of Daredevil when the hero helps someone out in his regular old persona rather than as a superhero. I just had trouble connecting with the character throughout the issue and the script failed to hook me. As for the art, we have Javier Pulido on pencils with Muntsa Vicente on colours and VC’s Claytown Cowles with the lettering (and production). To be honest, the art didn’t hook me at all either. And the big part of that is because the art lacks details. Its too simplistic. There is no depth to the art at all. A lot of people compare this comic to what Matt Fraction has done with Hawkeye and while I broadly agree that that’s what Soule is going for, the art is certainly nowhere near on the same level. David Aja has done some great work on the art there, and Pulido just doesn’t match up at all. And the colours, well, the colours are okay. Once again, its all about a lack of any depth, any nuance. I would have actually liked to have seen cover artist Kevin Wada tackle the art. I love that cover art. I was expecting a lot out of this comic, but it just doesn’t measure up. Maybe I’ll read the second issue, but I’m not too fussed about it. 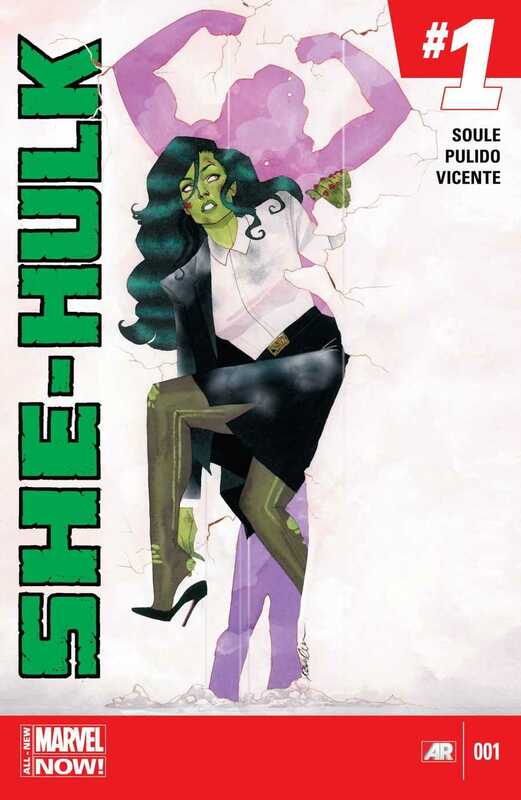 Posted on February 14, 2014, in Comics Reviews, Review Central and tagged All-New Marvel NOW!, Avengers, Charles Soule, Comics, Comics Review, Hulk, Javier Pulido, Jennifer Walter, Kevin Wada, Lawyers, Marvel Comics, Marvel Now, Muntsa Vicente, Review, Review Central, She-Hulk, VC's Clayton Cowles. Bookmark the permalink. 1 Comment.